With all the kinds of insurance out there — airline insurance, car rental insurance, credit insurance, even wedding insurance — it can be tough to figure out which are a waste and which are part of cautious planning for your financial future. 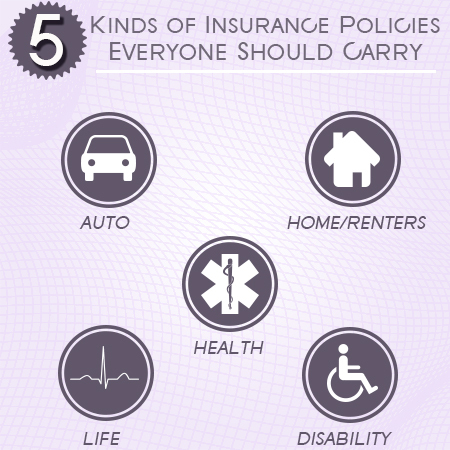 While your individual lifestyle and risk factors come into play with these decisions, of course, the experts agree that there are some kinds of insurance almost everyone should carry. This is the most obvious type of insurance to get immediately, and in most cases it’s mandated by law. Depending on what kind of car you drive, you should consider going beyond the legally required liability coverage and get a policy that covers car repairs or theft, too. It’s important that you never have gaps in your insurance coverage, since this tells future insurers that you’re a high-risk customer. Most homeowners know the importance of getting adequate insurance to protect what is probably their biggest lifetime investment. But it’s worth noting that most homeowners overestimate what their insurance covers, so it’s important to scrutinize your policy or give your insurance providers a call before you get too comfortable. And it’s not only owners who should be protecting their living space; did you know that there’s insurance for apartment renters, too? Renters insurance typically covers damage to your belongings, theft (even if the theft occurs somewhere other than the apartment) and liability if someone is injured in your rented home. The national debate over the Affordable Care Act has brought the topic of health insurance to the fore, but the reality is that many people still don’t have comprehensive health insurance. One of the most important things to look at when getting quotes on policies is the deductible; you don’t want to choose a policy because of its low premiums only to find out when you have an accident that you’ll pay thousands of dollars before your insurance kicks in. No one likes to think about it, but the reality for most income-earning adults is that someone would be left in a bind if they suddenly passed away. And yet three out of 10 American households have zero life insurance. If you have a spouse or children that depend on what you earn, then you should have life insurance. When determining the policy value you require, take into account not only what your family would need to maintain their lifestyle after your death, but also funeral costs and estate taxes. The good news is that people generally overestimate (by three times) what life insurance coverage will cost them, so it’s more affordable than you probably think. You should have the same mindset about disability insurance as you do about life insurance; that is, you should ask yourself what would happen to you and your family if you were no longer able to continue working. Keep in mind not only your present costs, but also long-term care that might not be covered by your health insurance. Would my home insurance protect me in the event of a sinkhole? Local service with conveniences of large insurance companies. What should I do about my auto insurance now that Im getting divorced? Who Covers the Inside of My Condominium – Me or the Homeowners Association?